Why must Tide insist on making its products look edible? It wasn’t enough that kids were nomming on Tide Pods—and thereby birthing actual Tide Pod-inspired food—now, the feedback loop closes even more tightly as Tide introduces its newest “Eco-Box” packaging that looks just like boxed wine. 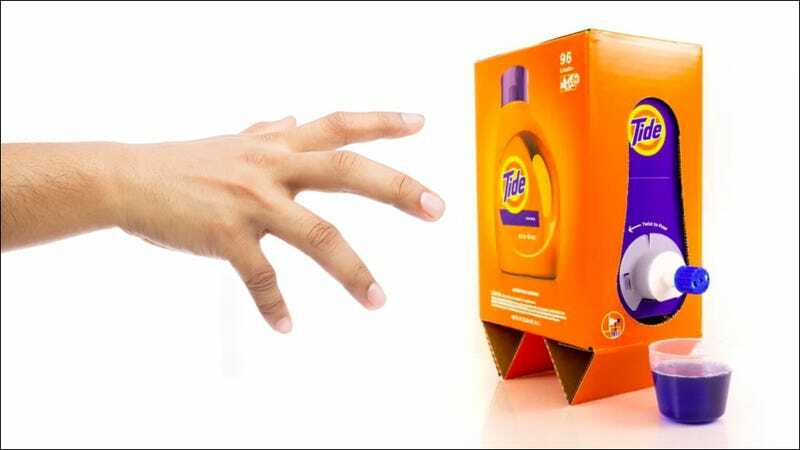 The packaging is designed specifically for e-commerce customers who buy Tide products through Amazon or online grocery stores. According to parent company Proctor & Gamble, the Eco-Box has a lighter shipping footprint (using 60 percent less plastic and 30 percent less water than the current 150-oz press-tap box) thanks to its foldable cardboard package and its “ultra-concentrated” (ultra-delicious?) liquid detergent. It also doesn’t requier any bubble wrap or additional packaging to ship. Once the Tide box arrives, a customer can unfold the Eco-Box to create an origami-looking stand that sits atop your laundry shelf or washing machine. But uh, are the designers aware that it looks like mama’s favorite box of cab sauv? “This is a fundamentally different approach than we’ve taken in the past and represents our relentless obsession with delighting consumers,” Sundar Raman, vice president of P&G’s North America fabric care business, said in a statement. I just want to know how many glasses of Tide it takes to take the edge off a rough Tuesday.